Therapy in the Age of Neuroscience: A Guide for Counsellors and Therapists is an essential guide to key areas of neuroscience that inform the theory underlying psychotherapy, and how they can be applied to practice. Laying out the science clearly and accessibly, it outlines what therapists need to know about the human nervous system in order to be able to engage with the subject. Chapters cover the neuroscience underlying key aspects of therapy such as relationships, emotion, anxiety, trauma and dissociation, the mind-body connection, and the processes which enable therapists to engage deeper aspects of mind and psyche. This book responds to the need for counsellors and therapists to have an accessible and comprehensive guide to contemporary neuroscience views of mind and body. Therapy in the Age of Neuroscience will appeal to psychotherapists, counsellors and other mental health professionals who wish to learn more about how to integrate neuroscience into their work. 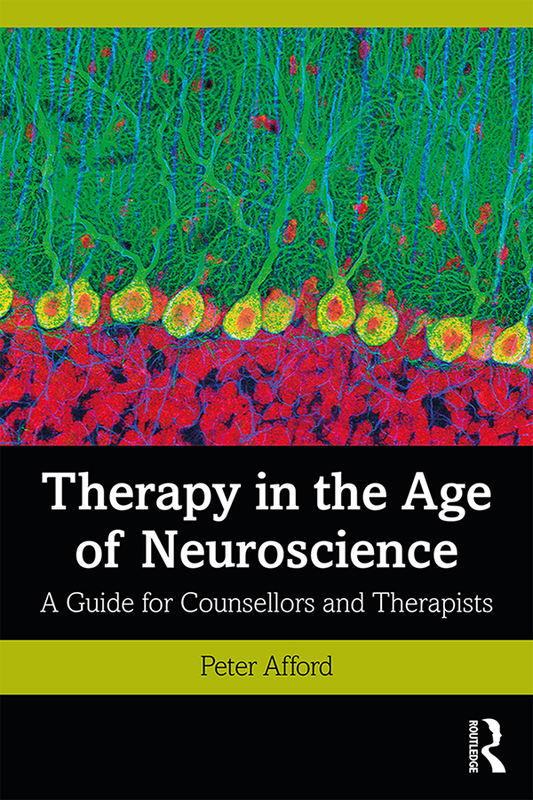 "In Therapy in the Age of Neuroscience, psychotherapist Peter Afford boldly integrates the voices of contemporary neuroscientists into a therapist- relevant narrative that interlaces psychological constructs including diagnostic features with a knowledge of the relevant role that specific neural structures play in movements, thoughts, and feelings. Through the lens of a therapist, the reader is informed how a knowledge of neuroscience can inform, support, and at times transform treatment models relevant to mental health." - Stephen W Porges, PhD, Distinguished University Scientist, Indiana University, Professor of Psychiatry, University of North Carolina, and author of The Pocket Guide to the Polyvagal Theory: The Transformative Power of Feeling Safe. "This book is a useful compendium of recent thinking on the emotional brain. Written in a clear, readable style, it will help psychotherapists to digest neuroscientific knowledge and integrate it with the practice of psychotherapy." - Sue Gerhardt, author of Why Love Matters. Peter Afford has worked as a counsellor and therapist in private practice and in organisations for over 25 years. He has developed and taught courses in neuroscience for therapists since 2007, and has been a Focusing teacher since the 1980s.